Among the many performance opportunities readily available to weACADEMIES students and teachers is The Master’s Plan, staged during certain Easter seasons by the Music and Fine Arts Department (MFA) of West End Assembly of God (WEAG). This Broadway-style musical production tells the story of the Jesus, from birth to resurrection, through the eyes of the fisherman/disciple Peter, scholarly Nicodemus and streetwise Mary Magdalene. 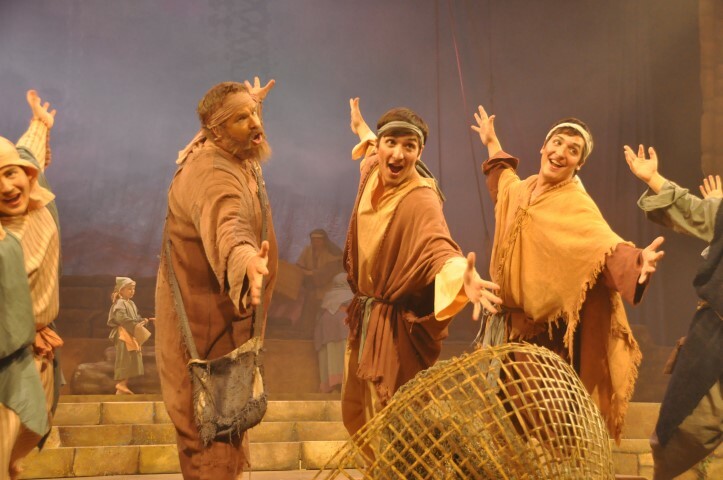 Transported into Biblical times by a spectacular combination of realistic sets and costumes, music, drama and dance, audiences experience the joy, despair, suffering, triumph and eternal hope embodied in the earthly life of Jesus Christ. A cast and crew of hundreds of children, youth and adults fill a variety of onstage, backstage and support positions. Current and former students and teachers of weACADEMIES, who are encouraged to use their gifts, talents and training in all MFA projects, figure prominently in casting the various dance, vocal and dramatic roles. weACADEMIES teachers choreograph and direct the production, and Music Academy teachers, and some advanced Music Academy students, also routinely perform with the Master’s Plan orchestra. Participation in Master’s Plan is not restricted to Church members, however, and information regarding open auditions for vocal, dramatic and dance roles, held in the early New Year, will be available on this site as well as at weag.org. In Master’s Plan years, tickets will be available in the several weeks preceding Palm Sunday, online at Glorious Christmas Nights, where details for mailing or phoning in ticket orders also may be found. And, while logged on to Glorious Christmas Nights, be sure to check out the photo galleries, trailers, and DVDs/CDs of past WEAG projects.